If you are a homeowner, you may be thinking, “How did I get into this?” when it comes to pondering your long-term loan agreement on your home. Most mortgages can stretch out 30 years and for many people, this is such a long time to even think about. You may be wondering if it is possible to pay it off early, so that you can get out from under your loan debt. The simple answer is, Yes! 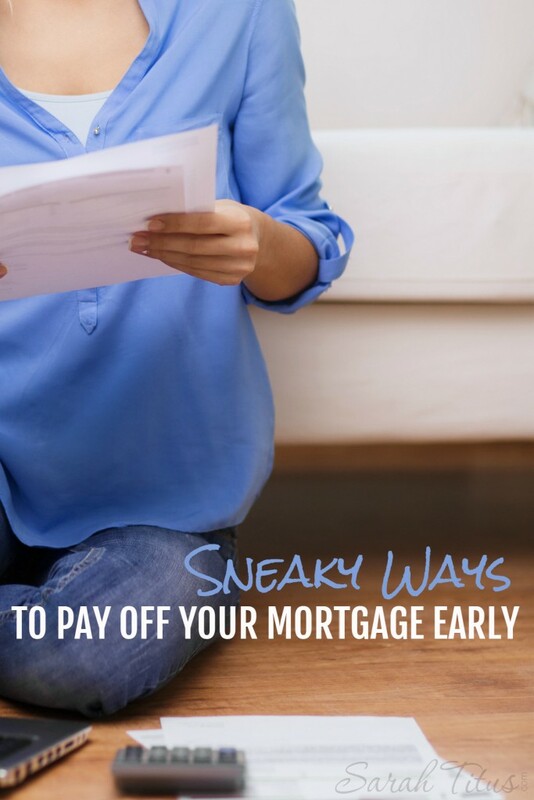 Here are some sneaky ways to pay off your mortgage early that will help drastically. Let’s say your mortgage payment is an uneven number like $788. Round up to $800 instead and you will lower how much you end up paying in interest over the long haul, as well as shave off several payments towards the end of your repayment time. 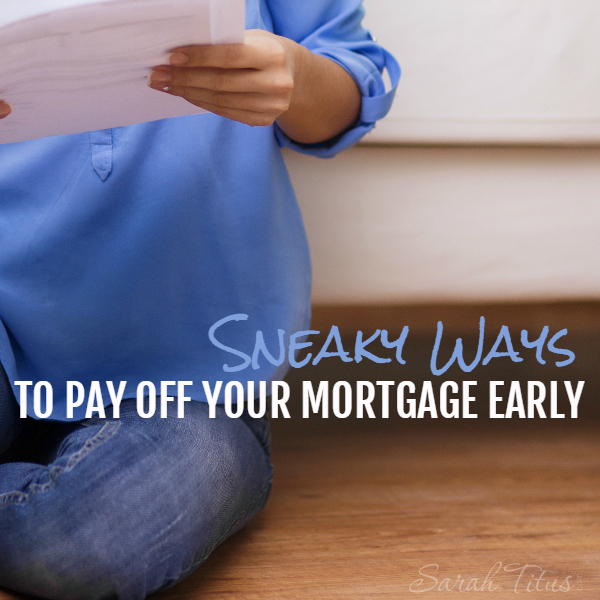 Keep “paying” a bill that you don’t have any more and apply it to your mortgage. Let’s say you have a car loan and you pay $250 a month for it for 5 years. After the 5 years is up, continue to “pay” the car loan (aka budget for it as you always have) and apply that $250 to your mortgage each month. You will cut many months of paying and possibly years by doing this and you won’t even feel like you are paying extra since you were already used to budgeting for it for 5 years before. You will be paying more each payment, but you will get it paid off faster in the end. Alternatively, you could keep your loan payment where it is at and just pay it as if you are on a shorter term loan. If you have the extra time, take jobs that usually pop up in the summer months or during the holidays for part time work and apply the entire amount to your mortgage. Sure, these jobs often don’t pay well, but they are a great way to make a few extra hundred dollars to give your payments a boost at certain times of the year and possibly cut off months to years of time on your loan. There are MANY ways to earn extra cash, and you can even do it from home! Check out my article, 10 Easiest Ways to Earn Extra Cash From Home. You are sure to find at least one idea you can do. Sell clothes, household goods, and furniture you don’t need in a yard sale or on Craigslist and apply what you make to your loan. You may only make a couple hundred dollars, but if you do that over the term of your loan, you will take time off of it. Every little bit helps! What have you done to pay off your mortgage early? Did I miss any other sneaky ideas? If you’re able to make one extra mortgage payment per year, you end up shaving off about 5 years of your mortgage. Some people do this by using their tax refund toward that extra payment each year. Since we own a business, we usually end up owing money instead of receiving a refund, so that hasn’t worked for us yet. Instead, we make payments biweekly instead of monthly or semimonthly. We have half of our normal mortgage payment withdrawn from our bank account every other week. Therefore, we end up making 26 half-payments per year, which works out to 13 payments per year instead of 12. Still an extra payment per year! We paid off our consumer debt (cars & student loans) which helped out so much when we started tackling our mortgage. We budget every penny and anything “extra” goes towards our mortgage. We have a 30-year mortgage, but should pay it off in a total of 5 years (a little more than a year from now). We can’t wait!!! That is SO incredibly awesome Nichole. I do the same, except that every extra penny goes to savings. 🙂 Saving up for a new car, then I’ll start on saving for a house. Not sure I can pull a house off fully in cash though…will have to see. lol. Sounds like you’re doing a fantastic job! Keep it up!! One of our favorite ways to payoff our mortgage faster is to have money transferred straight from my husband’s paycheck to our “mortgage account” each week. At the end of the year we toss it on our mortgage principle. It gives us a bit of insurance in case something crazy were to come up (hospital bills or something catastrophic). We do this on top of regularly paying down the principle each month. Instead of putting that car payment toward a mortgage shouldn’t you continue putting it in the bank in order to pay cash for the next car instead of financing? I can remember a time not so long ago when the typical mortgage interest was between 10 and 12 percent and the average car loan was between 7 and 12 percent. These numbers were for people with good credit. Yes interest came down but what comes down eventually goes back up. We always settled for less than than ideal but we survived. My husband was in the Navy so we were lucky that we always lived in great places with many fun and free activities. Hawaii was our favorite. I’ve just recently put myself on a budget after fighting it and making excuses for a very long time. One more credit card payment and that debt is gone! I even doubled up last month with all the money I wasn’t hemorrhaging. I called my mortgage lender and just asked them what I needed to pay towards the principal each month to pay off my loan in 10 years instead of 30. They gave me the magic number to add to my principal, I set it up in the automated system, and I still plan to contribute my tax returns every other year. I’m so excited about this! My house will be paid off before my son turns 18. And we can now go on family vacations! It just takes a little effort and you don’t even notice the sacrifice.